Yoga District’s teacher trainees learn how to share yoga with diverse communities. Learn to modify and amplify poses, customizing pace and cues to help your students explore yoga in the most supportive way possible. You learn how to teach anywhere, from homeless shelters to gyms, from yoga studios to daycare centers, from corporate settings to hospitals. The same Yoga District teacher director sticks with the same group of trainees through and through. So there’s no need to worry about receiving a segmented, piecemeal training with an ever-changing group of fellow trainees and inconsistent faculty. Yoga District is a yoga teacher owned and operated collective of studios with a nonprofit mission to make mindfulness accessible and affordable. While our pockets aren’t deep, our hearts are big, our tuition is low, our payment plans are long, our work/study options are plentiful, and we will never let inability to pay stop us from trying to work something out with potential trainees. 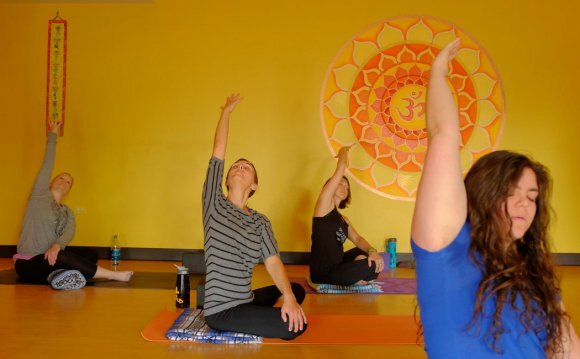 In addition to its 200 hour certification program, Yoga District offers a progressive course of study in its 500 hour training program, both for its graduates and graduates of other 200 hour teacher training programs. Continuing your education with a 500 hour training allows graduates to refine and advance their teaching skills and holistic lifestyle and presence as a yogi. Why do the teacher training? Because you love yoga and want to share its gifts. Trainees have joined our training programs for a wide variety of reasons. Whether it’s to teach in studios, schools, corporate or outreach settings, or just to advance your own practice, Yoga District’s diverse program helps meet trainees’ needs in a supportive environment. , a certified Prana Flow ® instructor, completed her 200 hour certification in 2008 and her 500 hour certification in 2011 through the Samudra Global School for Living Yoga. Kat now serves as both a mentor in the Teacher Training Program and works with the certification process of this school. She continues her formal study of Prana Flow with Shiva Rea and master teachers in the Prana Flow Tribe. She is intensely interested in Ayurveda and its application to asana, pranayama, and meditation. Kat continues her study with Maria Garre while working towards a certification in Ayuryoga through the Ayurvedic Institute. Kat now continues studying restorative and therapeutic applications of yoga. Patrick McCleaf has always been into movement. So much so that he decided to major in Kinesiology at the University of Maryland. When he put a hold on his passionate affair with Jiu Jitsu to finish his degree, Patrick fell into a somewhat consistent practice taking yoga for college credit. He soon found that vinyasa movement linked with the breath, brought him into those timeless states of clarity that he found in other athletics; soccer as a child, snowboarding as an adolescent, Jiu Jitsu as a young adult. Patrick enrolled in yoga teacher training immediately after graduating college, thinking that yoga could supplement personal training with teaching a few yoga classes. He fell in love with the practice when it became firmly rooted and earnest. Yama Niyama Asana Pranayama Pratyahra Dharana Dhyana Samadhi. It is challenging, demanding, frustrating, heartbreaking. It wears ‘you’ down. Every single day. And yet returning to the mat day after day continues to create more openness, awareness, and love than Patrick could ever have imaged. He practices and teaches Ashtanga and Rocket Yoga in Washington, D.C. Patrick has completed a 500-hour certification with Yoga District in Washington, D.C, and is currently working towards a 500-hour certification with Ashtanga Yoga Puerto Rico. Patrick is forever grateful to his partner and closest teacher, Sara “Bear” Gruss, a fellow Rocket and Dharma yoga teacher. Endless love to his teachers Faith Scimecca, David Kyle, Jasmine Chehrazi, Aqeel Viveka OM, Marie Belle Perez Rivera and all others who have touched his life.